"Then said Saul unto his armourbearer, Draw thy sword, and thrust me through therewith; lest these uncircumcised come and thrust me through, and abuse me. But his armourbearer would not; for he was sore afraid. Therefore Saul took a sword, and fell upon it." The books of reference used for this study of the book of 1st Samuel were the Bible, King James Version, called "The Companion Bible", Publisher Kregel; Strong's Exhaustive Concordance of the Bible, numbered to the Hebrew, Chaldee, and Greek, and English, coded to the Strong's Concordance numbers. "Rule Under the Judges [1-7]." "Elkanah and Family [1.4 - 2.11]." "Hannah's Vow to the Lord ." "Samuel Born, and Vow Fulfilled [21-28]." Chapter 2 "Hannah and Yahoveh [1-11]." "Sins of the Priesthood [12-17]." "Cause of the Separation of Church and State [19-24]." "The Calling of Samuel by the Lord [1-10]." "Samuel Established as Prophet [18-20]." Chapter 4 "Subjection to the Philistines [4:1 to 7:2]." Israel's Report of Defeat [10-22]"
Chapter 5 "The Ark in Captivity to the Philistines"
Chapter 6 "Consultation of Philistines [2-8]." "Removal of Ark from Beth-Shemesh [9-16]." Chapter 7 "Repentance of Israel [1-6]." "Deliverance from the Philistines [7-17]." Chapter 8 "Israel Desires a King." "Saul seeks to find the Asses [1-14]. " "The king sought, anointed and received [15-27]." Chapter 10 "Signs Given by Samuel to Saul[2-13]." Chapter 11 "Agression by Nahash the Ammonite [1-11]." Chapter 13 "Provocations by Saul [13:1 - 15:35]." "Jonathan's Sin, and the People's Sin [24-36]." "The Levies of Saul on the People [47-52]." Chapter 15 "War with the Amalekites [1-35]." Saul's Reproof by Samuel's Word [13-35]." Chapter 16 "David's Call and Anointing by God [1-13]." "Evil Spirits Troubling Saul [14-23]." Chapter 17 "David Opposed by Saul [17:1-27:4]." "David Kills Goliath, Philistines Flee [41-58]." Chapter 18 "Saul's Fear and Hostility to David [12-19]." "Trouble Against David by Use of Michal 20-27]." Chapter 19 "Evil spirits Incites Saul [1-8]." "Saul's Eight Attempts to Kill David [9-21]." "Saul's Ninth Attempt Thwarted by God [22-24]." Chapter 20 "Hostility to David"
"Visit of David to Jonathan"
"The Philistines Help in David's Flight 10-15]." Chapter 22 "David's Flight [1-5]." Chapter 23 "Relief of Keilah the Philistines to David [1-13]." "Pursuit of David by Saul [14-28]." 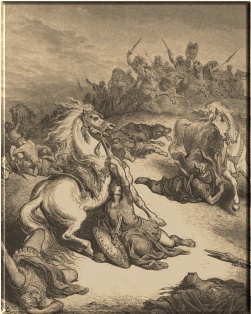 Chapter 24 "Saul Hounds David in Desert of En-Gedi ." "David Spares Saul's Life [7-15]." "Saul Acknowledges God's Will ." "Covenant Between Saul and David ." Chapter 25 "Actions of Nabal"
"David's Message to Nabal [5-12]." "Abigail's Pleadings to David [24-35]." "Nabal Dies, David takes Abigail to Wife [36-44]." Chapter 26 "David in the Desert of Ziph"
"Saul's Search for David [1-4]." "God delivered Saul into David's Hand [5-8]." "David spares Saul's Life [9-16]." "David's Reconciliation with Saul [17-25]." Chapter 27 "Provocation of Saul; Ziklag, David's Possession." Chapter 28 "Saul's Sin; Familiar Spirits"
"Familiar Spirits, Woman Sought [7-14]." "Answer From Familiar Spirit ]15-20]." "Familiar Spirits, Woman Spared [21-25]." Chapter 29 "The Philistine Army and David." Chapter 31 "The Battle that Claimed Saul's life."